To auction, buy or sell a Mata Hari autograph in our Mata Hari autograph auction, please contact NateDSanders.com at (310) 440-2982 or Nate@NateDSanders.com. 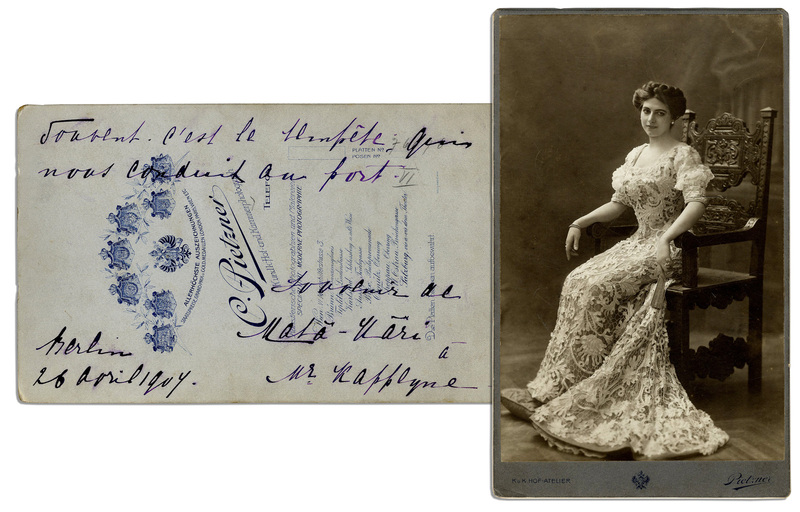 Mata Hari autograph and inscribed cabinet photograph datelined 26 April 1907 from Berlin, as she was gaining fame for her racy exotic dance routine that took Europe by storm. Mata Hari was Margaretha Geertruida ”Margreet” Zelle’s stage name, Indonesian for ”sun.” Ten years after this photo was taken, Hari was executed by firing squad on 15 October 1917 in France for aiding the Germans through espionage in WWI, a claim she denied until her death. Cabinet photo depicts Mata Hari posing on a wooden chair in an ornate lace gown and holding a fan. Hari signs and inscribes the verso of the photo to prominent Dutch lawyer, J. Kappeyne van de Coppello. Inscription in French reads: ”Souvent c’est le tempete qui nous conduit au port”, or, ”often it is the storm that leads us to the port”, and continues ”Souvenir de Mata Hari a Mr. Kappeyne – Berlin 26 avril 1907”. Inscription and signature are in bold, clear purple ink, with signature measuring close to 3”. Photo measures 5.25” x 8.5”, mounted to the Viennese photographer’s board, with his embossed imprint, K u. K. Hof-Atelier / Pietzner. Verso also has an imprint of the same photographer, with various Austrian royal crests depicted. Near fine. Sold for $7,361.